The All Terrain Radial SXT delivers a quiet, comfortable ride, superior stability and control. 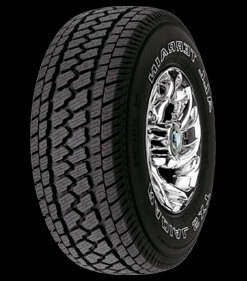 If you drive a Light Truck or Sport Utility Vehicle this tire is a great choice for you. Enhances wet traction and winter performance on snow and ice while contributing to a smooth, quiet ride. A range of sizes fills the replacement requirements for the most popular pick ups, and vans used for commercial or recreational purposes. Outline white letters and blackwall stylings are available in specific sizes.